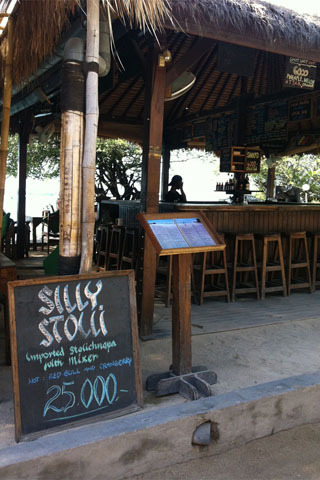 Of the three islands, Gili Trawangan has by far the widest range of eateries and a bunch of bars. Something for everyone. 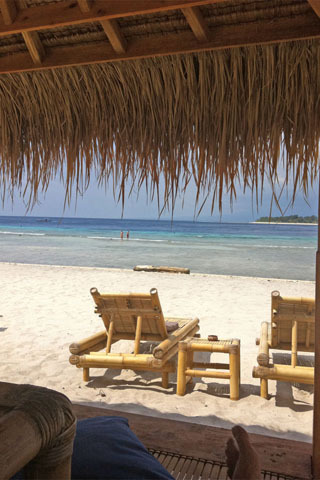 Made’s does only Indonesian fare — a refreshing change from the prevalent tendency among Gili T restaurants to offer every cuisine on the planet. And they do it well — very well, with friendly, efficient service that is so much better than elsewhere you wish they’d offer training. Dishes can be requested as tourist spicy or Lombok spicy — we went with the latter and it is... Read our full review of Made's Waroeng. It’s a very foreigner-friendly market, with lots of menus in English, and most vendors will have at least enough English to put a plate of satay in front of you. Full range of typical market fare is available, at not too-inflated prices. The market gets going around sundown daily. For solo travellers, this is a good place to meet up with others as the seating is mostly long benches.... Read our full review of Night Market. Just north of the turtle hatchery, The Little Mermaid has a couple of streetside salas along with beach furniture -- grab a sala if you can. 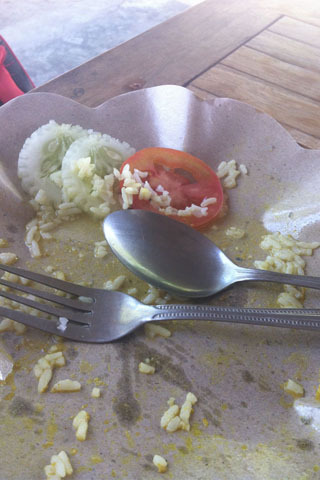 Food is reasonable and the Indonesian fare is a step above most of the offerings around here. Very obliging staff and a good stretch of beach out front more than compensate for a decidedly slow... Read our full review of The Little Mermaid. With a menu stretching from Cambodian to Cajun, we were a little dubious so opted for Indonesian, but it was good! Very popular through the afternoon when the plentiful trees lend shade, this is a good spot for lunch or just grazing. Service was amiable and we found this to be a relaxing spot to while away a few... Read our full review of Fortuna Cafe. 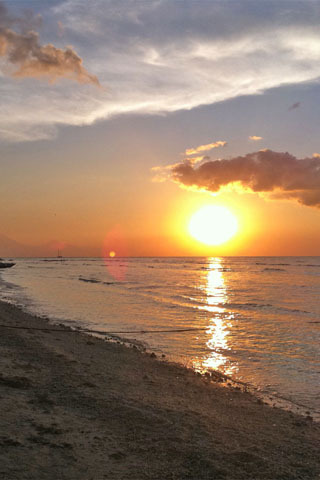 It gets hectic come the evening and is popular especially among Bali expats and mid-range tourists who are not put off by higher prices than what you may pay elsewhere. 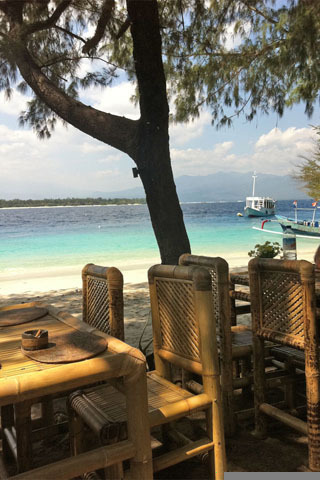 Attached to Tir Ta Nog is Balinese Japanese chain, Ryoshi. They’ve got a more limited menu at higher prices than what you’d pay for the same back on... Read our full review of Tir Ta Nog and Ryoshi. Not nearly as popular as nearby Tir Ta Nog, Black Penny has an exhaustive (and quite expensive) menu covering everything from rendang to French fries and makes for a good alternative if Tir Ta Nog is too busy for your liking. There’s seating at the large round bar, tables and chairs, and (our preferred location) a long bench table running along the waterfront. Service is attentive and free... Read our full review of Black Penny. 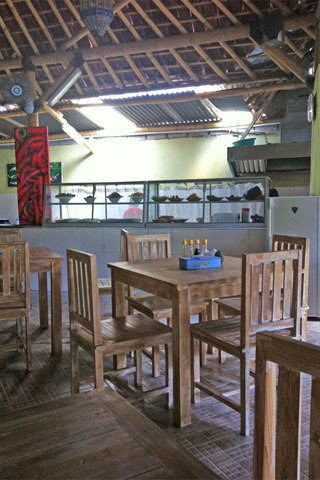 t’s stock standard local fare -- nasi campur, mie goreng, nasi goreng and so on are served in a comfortable setting (though with Indonesian TV at high volume) in the back blocks of Gili Trawanagan village. 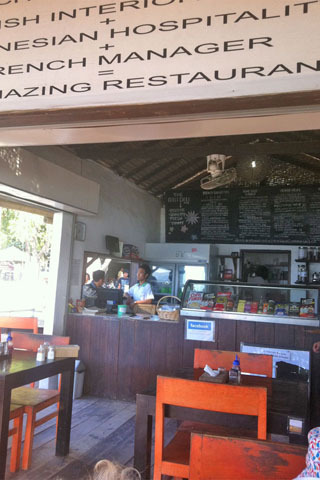 Far better than any Indonesian we had on the beach, save Made’s Waroeng (which is easily the best on the... Read our full review of Warung Indonesia. Their menu is Western focused, with delicious sandwiches and other Western classics featured, and the coffee is excellent. Alas, the service here is very hit and miss. Don’t come here if you’re in a hurry and you may have to be patient with staff taking a few goes to get your order right, as well. Prices are not cheap, but fair for the quality on offer. Great breakfasts if your room... Read our full review of Scallywags. 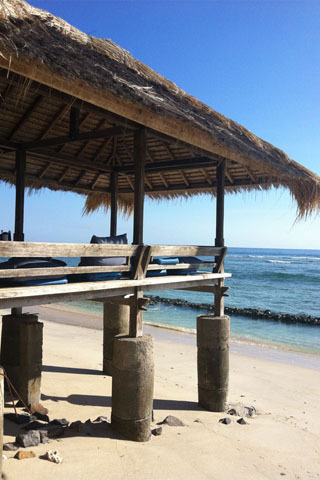 The shack was built from the wreckage of a boat that ran onto the reef a year or so back (the beach is still littered with lumber that Kismet said was from the wreck) and it simply makes a good spot to kick back and have a drink on a round-island trip. 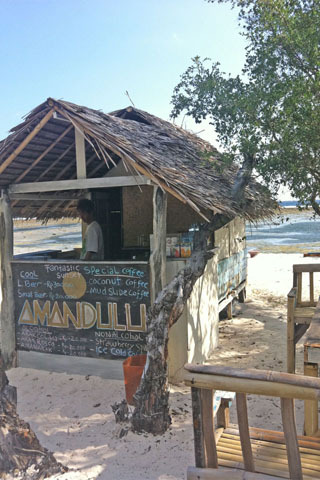 There’s new budget accommodation going in nearby, so could be worth a look in as an isolated place to stay by the time you read... Read our full review of Amandulu. 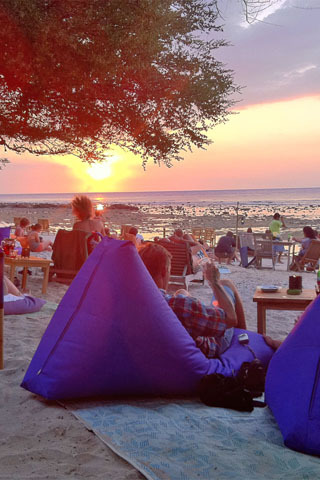 This is a terrific vantage point for Trawangan’s trademark glorious sunset and Karma Kayak does its best to make the most of it, putting out low slung tables and beanbags, but, at least in our experience, they’ve got a bit of work to do on the staffing angle. 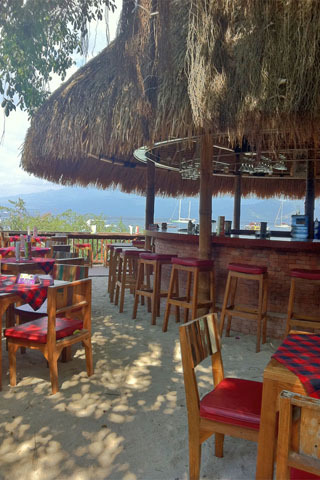 It was a recurring, unpleasant theme on Gili Trawangan to have staff throw change on the table, but it was only at Karma Kayak that... Read our full review of Karma Kayak Tapas Bar. The upside of them serving the food at a pace to rival a glacier is that you get all the more time to enjoy both the view and the feeling of being situated over the swirling turquoise waters. Food is mediocre, though they make a fuss about wood-fired pizzas which we didn’t get to try, and this is a sought-after spot for a sundowner — get in... Read our full review of Coral Beach 1. 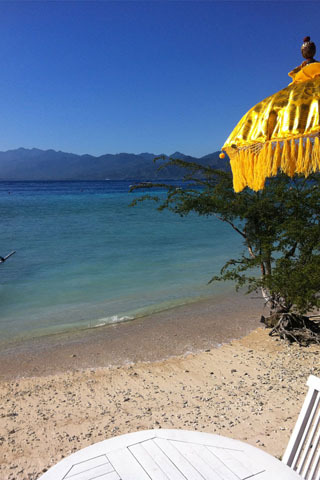 There’s some quite good high-tide snorkelling offshore from here, with a drop-off and plenty of fish, so go for a snorkel after you order as you’ll have time to swim to Gili Meno and back before the food arrives. Service is friendly and tries hard, but pretty clueless. This is nevertheless a good spot for a slow afternoon taking shelter from the blazing sun. Good spot for pics to send back to... Read our full review of Blue Star. Menu is similar to the Bali original but we found the food, and especially the coffee, to be very variable -- the latter swinging from excellent to undrinkable in a single seating, which was odd considering it’s from a pre-set machine. Likewise the food can be very hit and miss. 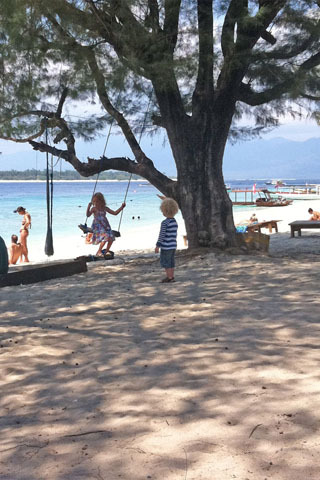 It’s a shame, as we really love the Seminyak original and this one has loads of potential and is beautifully laid... Read our full review of Cafe Gili. You’ll see the grand sign up top lauding their food, warmth and interior design, though not surprisingly you won’t see training nor service mentioned. Orders repeatedly mixed up, zero initiative, tables giving up and leaving after waiting 30 minutes for a bowl of muesli -- the staff were so inept we started to think they were being deliberately obstinate. 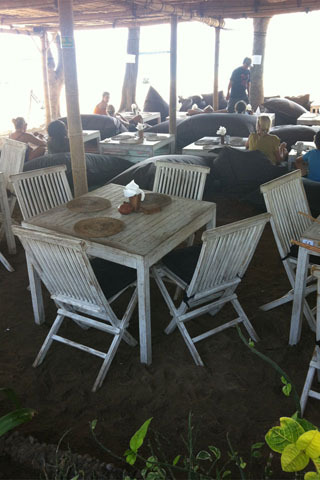 On the upside, the coffee is... Read our full review of Gili Deli.